If you are in a market to look out for the perfect stone for your kitchen countertop, then look no further than a Granite countertop. What makes Granite most unique and the preferred choice for the use in kitchen are its benefits. The Modern granite countertops advantages make it the most suggested stone by the architects and the interior decorators alike. No matter how small or large your kitchen is, the granite top makes it look awesome every time. Here are some top benefits of granite. The first benefit of the granite top is its amazing look. This is the main reason why people opt for granite countertops for the kitchen. It not only looks classy, but it also goes along with the rest of the décor in your house. As Modern granite countertops Edmonton can be had in various designs and colors, you can get one that matches your need and taste. It makes your kitchen look rich and adds a dab of glamour to the look of your home. Granite is available in various shades, colors, and design patters. You can choose from up to 20 shades of colors and you can have the stone in various sizes. If you want a single slab for the kitchen countertop, then you can have it along with the grain designs. You can even choose to have the granites in small sizes and creating a design patter as you fix it on the countertop. Granite is a very hard stone and thus offers resistance to scratches and this makes it perfect choice in the kitchen. It is an extremely durable stone and will last you for years. It is perfectly safe from normal wear and tear and you have to worry about putting weight and hot dishes over it while working in the kitchen. Granite, to a very large extent, is also resistant to stains and if you spill things like curry or coffee over the stone, then all you have to do is to wipe the spillage using a wet cloth and you will be done cleaning the stone. You don’t have to go through the whole market to search the Granite stone of your choice. All you have to do, is to go to any shop of Modern granite countertops Edmonton and you can select the stone of your choice. It is very easily available and can be replaced and installed whenever you like it. Many sellers always have huge stocks with them and availability with Granite is never a problem. 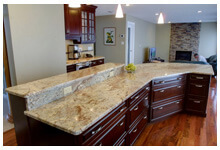 Granite countertops are very easy to maintain and you don’t have to follow any specific procedure to clean the stone. You just have to clean it using a soft cloth or sponge on daily basis to keep it shining like new. You can use your normal kitchen dishwashing liquid to clean the countertop to bring back the lost shine.